We offer more than just accounts and loans. Take advantage of all our convenient services. Enjoy additional banking services for your convenience. For your convenience, we offer a wide range of banking services. These services include wire transfers, foreign currency exchange, gift cards, cashier's checks, and notary services. If you wish to initiate a foreign wire transfer, you will need to obtain wiring instructions from the beneficiary of the funds including Name, Address and Account Number of the Beneficiary and Name, Address, and IBAN/Account number or Swift Code of the receiving Foreign Bank as well as type of funds (US Dollars or Foreign Currency), amount to be sent, and the reason for the wire transfer. If you are sending the funds through a U.S. corresponding bank we will need the corresponding banking name and routing number/ABA. To initiate a wire transfer, please visit a branch or log into Online Banking to submit a form. We will determine whether an error occurred within 90 days after you contact us and we will correct any error promptly. We will tell you the results within three business days after completing our investigation. If we decide that there was not error, we will send you a written explanation. You may ask for copies of any documents we used in our investigation. You have the right to cancel a remittance transfer and obtain a refund of all funds paid to us, including any fees. In order to cancel, you must contact us at the 301-929-7990 or wires@lfcu.org within 30 minutes of payment for the transfer. Make your trip more convenient and eliminate hassles by using eZforex Online Foreign Exchange Solution to exchange your currency before you go abroad. Buy "Currency Price Protection” so you can purchase up to $2,500 USD of most foreign currencies and return any amount at the same exchange rate as originally purchased. All purchases are securely delivered by Travelex to your home or office before you leave for your trip. Your Mastercard® Gift Card is a prepaid Debit Mastercard® Card with a specific dollar value. Your Mastercard® Gift Card and its value are accepted at most places Debit Mastercard® is accepted. How do I activate my gift card and obtain my PIN? Gift cards can be activated online at https://mygiftcardaccount.pscufs.com; a PIN will be displayed after activation. Call the number on the back of your card for balances and transaction history or visit https://mygiftcardaccount.pscufs.com. You can use your Mastercard® Gift Card at most places Debit Mastercard® is accepted. In order to use the gift card online, you must register at https://mygiftcardaccount.pscufs.com. Select Register Card under the Account Activities section. See Terms and Conditions for further information. What should I do when the merchant’s sales terminal asks me to press "Debit” or "Credit”? You have the option to press ‘Credit’ or ‘Debit’ button. 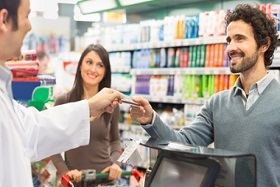 The credit transaction will require you to sign a sales receipt to authorize the purchase and the debit transaction will require you to enter your PIN to authorize the purchase. Hotels, car rentals, and cruise lines all assume an additional 15% added to the transaction authorization amount. Restaurants, taxis/limousines, beauty/barber shops, and health/beauty spas all assume an additional 20% added to the transaction authorization amount. Automated fuel dispensers assume a $100 preauthorization hold for the transaction. Cruise lines, hotels, and vehicle rental authorization hold times are for 30 days. In the event you need to return an item you purchased with your Mastercard® Gift Card, the merchant will handle the item in accordance with Mastercard® guidelines.The merchant may credit your card (put the funds back on the card) thereby increasing your available funds. What should I do if my Mastercard® Gift Card is lost or stolen? Contact the Mastercard® Gift Card Center immediately at 1-866-902-6082. Additionally, read the Mastercard® Gift Card Center Terms and Conditions contained in your cardholder for important Mastercard® Gift Card information. Our credit union offers cashier's checks for members. Visit your local branch for more information. We offer free notary services for our members at all branches. MasterCard Gift Cards, Cashier’s Checks, Notary Services, and Foreign Currency Exchange are not a deposit project, and are not federally insured or guaranteed by your credit union.